In thinking of what you think about (see the previous post), think about this as well. Do you think for yourself, or do you succumb to peer pressure? You were given life for a purpose, with a purpose, on purpose. You cannot find and fulfill that purpose without you being you. Your value to yourself and the rest of us, is the unique you. There is no one else like you and therefore no one else can fulfill your purpose. You can’t be the unique you if you don’t think for yourself, or “if you go along to get along”. 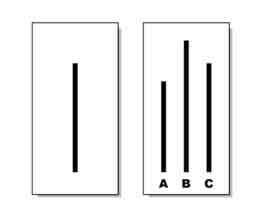 Which line…A, B, or C is most like the single line on the left? There is a famous psychological study, known as the Asch experiment. This study shows how we are so influenced by the group that we agree even when they are clearly wrong and we know it. In this study, there were groups of eight people, with each asked the same question as above, for each of a total of eighteen different line size comparisons in each group. Seven of the eight participants in each group were shills. When asked the question, each participant had to answer out loud. The lone subject of the experiment always went last. On twelve of the eighteen comparisons (the critical trials), the seven shills purposely gave the same and wrong answer. Results: On average, 32% of the lone subjects went along and conformed with the clearly incorrect majority on the critical trials. Over the 12 critical trials about 75% of the lone subjects conformed at least once. If you don’t think for yourself, if you succumb to “group think”, if you don’t question, then you can’t be you, and you can’t grow. If we all behave that way, then the world we all wish for will never be and just remain a wish. I conform therefore you are.